Ignore the below as no longer current as of September 2016. Ulrich's book is temporarily unavailable to buy online. It didn't make sense economically to carry on doing it the way I have been. I'll make it available another way soon, most likely via print-on-demand, or get someone else to publish it, but it may take a while to arrange. In the meantime if you're desperate you may still be able to obtain the New Zealand edition published by Lawrence and Gibson, or if you're very very desperate contact me and I might conceivably be able to sell you a copy from my private stash, but that's bound to be shambolic, it takes weeks for me to get to a post office, and they've been kept under a bed and the cat's probably pissed on them, and blah blah blah blah blah. I am pleased to announce that my good friend Ulrich Haarburste's book is finally available. 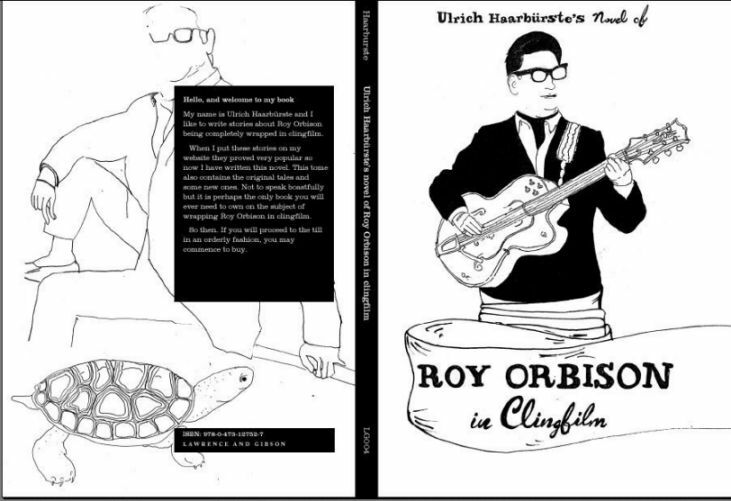 'Ulrich Haarburste's Novel of Roy Orbison in Clingfilm' is a paperback of 192 pages, A-format (that is 7 inches by 4.4, the smaller of the two normal sizes). The cover board is a cheeky little one-sided 200gsm with gloss UV varnish, the text paper a hand-picked Ensobelle 60gsm 120micron, taken from only the prettiest and most historically important of trees. Lovingly assembled by a mixture of cutting-edge technology and traditional craftsmanship, it is highly unlikely to explode and blow your ____ing face off. However Kelly Enterprises can accept no liability in case of accident. The product should not be applied rectally, although the book reviewers may have the final word on that. The cover design is spartan minimalist and seems likely to become a classic. It costs seven royal pounds, or whatever the equivalent is in flimsy foreign Monopoly money. 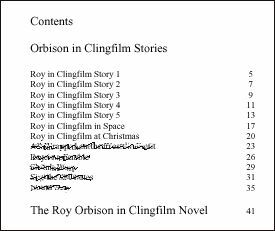 The book contains the original Orbison in Clingfilm stories from Ulrich's site, five new ones, and, God help me, an Orbison in Clingfilm novel. Titles of new stories have been obscured for greater suspense. But they involve Roy Orbison. Being wrapped in clingfilm. Can I buy it online? Are you sure you want to? What if your wife or husband or someone finds your credit card bills? What if government agents are tracking your net usage? Twenty years from now you could be a crusading MP or congressman or whatever, about to cast the deciding vote on a piece of legislation you've spent months pushing through which will abolish all bad things and make the world a happy place for everyone for ever, and just as you stand up to speak you hear a little sticky rasp and look round to see a Man In Black - with dark glasses - an agent of the Evil World Ruling Cabal, standing at the back of the auditorium toying with a roll of clingfilm, smiling menacingly and shaking his head at you forbiddingly. Instantly you realise, he knows, and you're buggered. You swallow drily, sweat starting on your brow, and try to resume. "Mister Speaker...as sponsor of this bill," - you hear another rasp - "as sponsor of this bill, which we have all fought long and hard to bring into existence" - rasp - "this bill to abolish all bad things and make everyone happy forever," - behind you the evil agent gives a cough that sounds like, Jetta - "I am suddenly compelled to ask, are we rushing into this? Are we making a grave mistake? Are bad things really all that bad? Poverty, disease, war, crime, corruption - are these things not part of the lifeblood of any great nation? Who are we to abolish them? Foolish nonsense... must change my vote... consistency is the hobgoblin of small minds... bigger picture..."
Can I order it from Amazon? No. Or you might be able to try but it's not worth it. To obtain a proper Amazon listing publishers have to give them a reduction of 50% or more, and agree to various other things, which I can't afford. They'll list you as in stock if the book is stocked by wholesalers, but I don't know if that's going to happen either as wholesalers want a similar cut. Currently the book is listed on Amazon UK by default - this happens automatically once you have an ISBN number. But it says '4-6 weeks to obtain' and adds a £2 'hard to source' fee (it wouldn't be hard to source at all, they'd just have to type in a request through the Nielsen system, but they can't be bothered). I really don't know what would happen if you tried to order it from them. From my own experience trying to order books from small imprints by that route, they would likely just mess you around for six weeks and then announce they'd been unable to find it. At some point in the future my distributor may set up something where we would avoid all these problems by having an Amazon shop, but that remains theoretical for now. Really, you might as well order via the online link above, which is cheaper than Amazon, or via a bookshop, see below. Update - I've received word that despite the above someone successfully ordered it from Amazon - it seems the main wholesalers actually have taken a certain number of copies into stock. So, it is possible to order it from Amazon UK (if you have an account with any other Amazon you can log in to Amazon UK with the same password), but it does take weeks, there is a £2 surcharge, and, I repeat, my own online seller is much cheaper (and will deliver all over the world). My distributor's Amazon shop has now been set up - on the Amazon.co.uk webpage for the book click on 'Used and New available' then 'New' then 'York Publishing'. But I would still suggest you use their own online shop in preference - it's simple to use, Ulrich and I get more money, and it's still cheaper for you. Most bookshops are only too happy to take orders for books they don't have in stock. Just tell them the title, author's name and/or ISBN. But again - are you sure you want to? Are you really going to walk up to the counter in a bookshop, probably staffed either with foxy totty or a nice lady who could be your mum, and ask for a book of fantasies about wrapping a dead pop star in plastic? 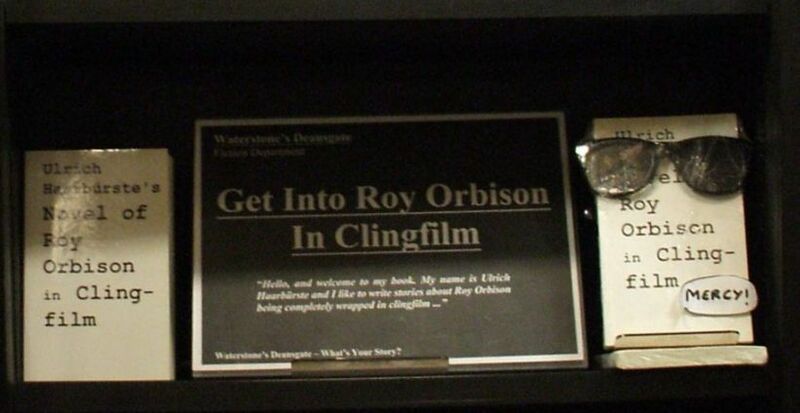 Are you really going to say 'Ulrich Haarburste's Novel of Roy Orbison in Clingfilm' out loud? In a shop full of people? Perhaps you could write it down and pretend to be mute. As for being able to just walk in and find it on the shelves, I'm working on selling it to bookshops now; it depends on whether any buy it. But again - would you even dare to take it off the shelf? You would still have to take it and show it to the totty/nice mum-type lady at the counter. Shoplifting is your best bet. But then, what if you get run over before you get home? The mortuary would give the book to your parents saying it was found on your body, and imagine how devastated they would be. Your Mum wouldn't know it was a joke. She'd think you were into that. Depends on the shop but I would think this would be possible. You'd have to pay the postage charges and what have you on top of the cover price - check with the shop. If this current enterprise isn't a complete debacle I'll be trying to arrange overseas editions eventually. There's just been a rather misleading article about the book in a Canadian newspaper group. Despite having read the page above, as he referred to it in our exchange, and despite not having read the book, the journalist states that it's 'backed by a U.K. publishing house' and opines that this 'is reason for aspiring writers worldwide who have yet to see their work published' to lay violent hands on themselves out of rage and frustration. For the benefit of them, the book is entirely self-published and backed by no-one but me. Savvy? I am the publisher, I assembled the book and paid for the printing, I am responsible for the whole thing from start to finish, I spent six months arranging the distribution, and all the money risked on the venture is mine. Although Ulrich kindly granted the journalist a lengthy audience, he has been disappointed to find that only one of his mots made it to the finished article and he fears lest his musings be lost to posterity. To mollify him I have posted the unedited interview on his website, here. That is most cool indeed. I don't know if you can see on the picture but the book itself is wrapped in clingfilm and they've also been wrapping copies in clingfilm for customers. Many, many thanks to Chris and the rest of the staff. And thanks for sending the picture. Today was a good day. It's days like today that make you feel it's almost worth getting out of the uterus. And! I gather Waterstone's Brighton have a load of copies in stock too. It's also definitely been taken by Waterstone's Edinburgh George Street and Waterstone's 311 Oxford Street London, but I don't know how many because my initial sales report was useless, and by John Smith campus bookshops in Dundee and the University of London. This was as of several weeks ago, there's a time lag with my reports, so I don't know if anyone else has it yet. Also, for those who didn't see when it was on the front page, I've had a breathtaking, blushmaking review from a woman who has a literary radio show in America. It was so good, in fact, I've decided I can't link it in case anyone thinks I believe it. Put it this way, it was so favourable that even Ulrich felt flattered. He told me that 'At long last I feel some small hope that I may after all be fully understood within my lifetime' and has forwarded it to the Nobel Prize Commitee. An edition has been published in New Zealand by Lawrence & Gibson. Click here to see the cover. At the launch party a new world record for the most number of people wrapped in clingfilm simultaneously was established (41), although there was not, technically, an old world record. My own online sellers will of course deliver anywhere in the world. Also now in stock in The Broadway Bookshop, Broadway Market, Hackney (the first independent bookshop in Britain to take it) and the Waterstones in Garrick Street and Camden High Street in London. As well as all the places mentioned previously and about a dozen others I should have mentioned ages ago but I forgot and now I can't find the reports. Waterstone's in Manchester Deansgate are still ordering it by the shedload. Any of the other places I mentioned may also still have it in stock, especially Waterstone's Brighton and The Broadway Bookshop, who also ordered some fairly recently. Otherwise you can order it from a bookshop or online. For Americans, it is often in stock in the excellent Quimby's in Chicago at 1854 W. North Avenue, who are selling crazy copies and I wish I could find an American distributor. If not, my online sellers will deliver overseas. 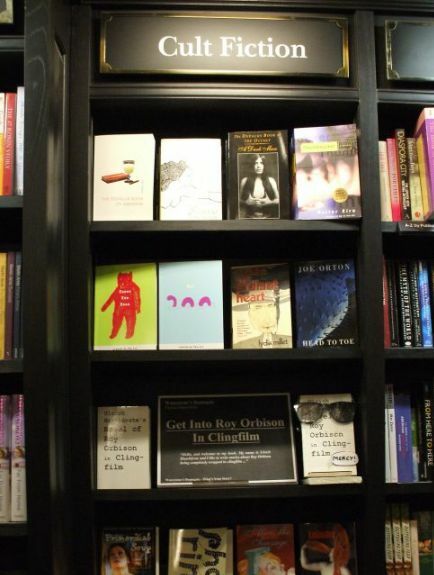 Incidentally, Waterstone's Manchester probably always have been and always will be the best damn bookshop in the country, and I'm not just saying that because of the lovely display above. Every time I've been in it's been like a child's dream of a sweetshop, like Borges's Library at Babel. I must try and find the link to a forum I stumbled on where a former member of staff was talking about the time (when they had about half a dozen future writers working there) when they became the first Waterstone's to clear a million quid turnover over Christmas, largely by virtue of stocking copies of, oh, every damn book that has ever existed. I think I was there that year: I staggered to the till barely able to see over books, mostly for myself I have to say, but a woman ahead of me in the queue bought £100 worth. Mostly paperbacks, and this was a time when £100 was worth a lot more and books were much cheaper; you could buy a lot for a hundred quid and it was a hell of a lot to spend on them. She giggled with embarrassment, I remember, when the total was announced, but was completely happy. I bet few of those books were for Christmas presents either. I will track that woman down one day and marry her. A glowing review in the rather prestigious 'Review of Contemporary Fiction' in the US. Ulrich is rubbing shoulders with some very exalted company there. I still don't have an American distributor. I have lost track of which bookshops are ordering it in Britain. I know there's at least one Waterstone's in London ordering it in barrowloads but I'm not sure which one. I am rubbish. I was not meant to be a businessman. Commerce is vulgar and sordid. Wanted, a fat sweaty man with a cigar to help me with this and steal all the profits. Must put his arm around my shoulder avuncularly and say things like, 'Trust me and you'll be farting through silk.' Should then fart through silk to demonstrate. It is a strangely beautiful sound, like the gentle sough of a cut souffle deflating. At gatherings of the Confederation of British Industry they do it competitively, awarding points for both duration and elegance. YPS are now handling the direct online sales as well as bookshop orders. The new online sales page is here. By the way I occasionally hear from or of people who've bought it or are planning to buy it for insane prices on Amazon. Don't! Use my online sellers! It's cheap as chips there and they won't rob you, or at least they haven't robbed anyone yet.